2013 Upgrade / Microstep CNC Cutting Controller. It has perfect cutting technology and 10.4color display screen and integrated keyboard panel. It keeps the desgin tradition of START and 20-year cutting experience and get all clients acceptance. Function Feature It adopts industrial ARM chip, superlarge scale integrated high-speed hardware interpolator, low consumption, low heat, no need to compulsive heat dissipation, reliable and steady hardware. Rich software functions, freely change between flame and plasma, adjust preheat delay, piercing troch up and down delay, piercing delay and so on according to different steel plates and machines. 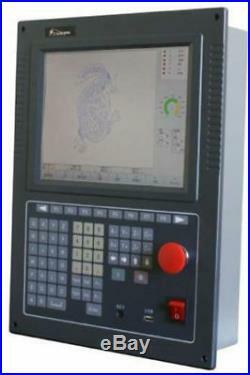 It has following functions, steel plate alignment, kerf compensation, broken point recover, original track back to cut, transfer to cuting, start from random program, piercing point choice, torch random position to adjust and choose, prerun outline, spin parts, mirror, array, zoom in scale and so on. Cutting program preprocess function, additional electronic gear adjustment, inflexion point auto speedup and speeddown, equal different up and down. Operating Interface in Chinese and English, dynamic graphic display, dynamic imitating cutting track, real-time display cutitng state and input/output state There is a standard graphic library and simple nesting function. Convenient operation for users, manual program by in-built or external keyboard Its compatible with IBE, FASTCAM and other CAD/CAM nesting software. U disk reads program and software upgrade. Handheld remote controller is optional. It has functions of moving, positioning, speedup, speeddown, cutting processing and so on. X / y 2 axis, Can be extended to 4-axis or X / Y drive any bilateral. Pulse Equivalent electroni gear numerator/denominator setup scope(165535). Smallest Programm Unit 0.001mm. I/O Control 16 optoelectronic input, 14 optoelectronic output. Extension Port USB, RS232, standard keyboard. Display Resolution 10.4,640×480,,32 truecolor. Advanced cutting technology, such as corner speed automatic control, torch height control, wireless remote control, etc. Kerf compensation function and check whether its reasonable, then report to the user for reference. Break point recover, auto poweroff recover, break point memory. Random section selection and pierce point selection. Thick plate outside edge pierce and thin plate cross-bridge function. Common 24 figures are available in the controller. 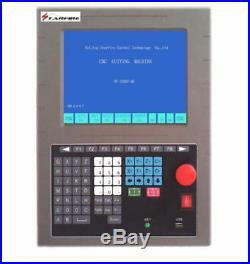 The item "10.4 LCD CNC Control System Flame/plasma Cutting Machine CNC Controller 2200H a" is in sale since Thursday, August 17, 2017. This item is in the category "Business & Industrial\CNC, Metalworking & Manufacturing\Welding & Soldering Equipment\Welding\Welders, Cutters & Torches\Plasma Cutters". The seller is "accuni-express" and is located in CN,CN.